High volatility, but great fun along the way! 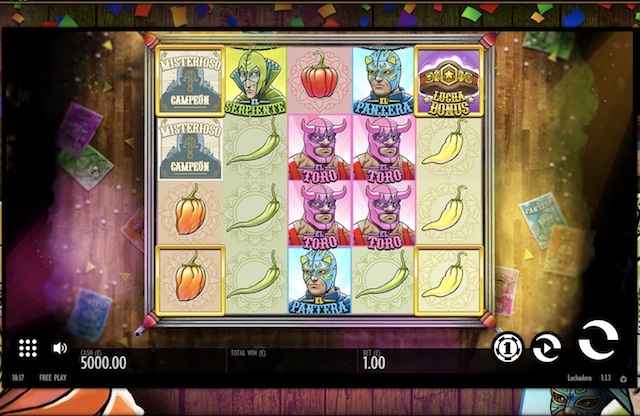 The brilliant Luchadora Slot from Thunderkick is another Mexican-themed game, coming from the same studio that brought us Esquelito Explosive, based on the Mexican day of the dead. Luchadora takes Mexican wrestling as its theme and mines the sport for some amazing artwork and clever features and bonus rounds. If you haven’t already heard of Thunderkick, then now is your chance to get to grips with a title from one of the best up and coming slot studios currently developing games. Here, four wrestlers occupy the reels and can turn wild if they land on special ‘corner’ squares. There is also a Free Spins feature, with up to 15 extra plays, and a ‘smackdown’ feature that gives out multipliers of up to 15x. The game plays on a 5 reel and 30 payline format and is certainly a medium to high volatility slot. Luchadora RTP (Return to Player) is 96.2%. You may wish to play for free to start with and get the feel for its rhythm before you spend your cash, because it can burn your bankroll pretty quickly before paying out. All Thunderkick games are built to display and run seamlessly on all devices, so whether you like to play on desktop, mobile or tablet, Luchardora won’t let you down. Play for fun or for real at any of our top recommended casinos – try Casumo Casino – or read on for our full game review. Mexico is a rich source of inspiration for game studios it seems. Earlier this year we had Beautiful Bones form Microgaming (another Mexican Day of the Dead slot) and now we have Luchadora, with wrestlers in masks taking center stage. The backdrop to the game is a wall full of posters advertising bouts. The lower value symbols are chillis colored Green through to Red. The wrestlers are also four colors and have names: Pink – Toro, Orange – Rayo, Green – Serpiente, Blue – Pantera. Other symbols are Lucha Smackdown – activates Free Spins and Multipliers; Misterioso Campion (Mystery Champion) and the high paying, Luchadora. Play Luchadora Slot from 10p up to £100 per spin. The format of the game screen is the same as all other Thunderkick slots, so it’s easy to find your way around if you’ve played other games from them before. If not, you’ll soon get used to it. You can set Autoplay to run up to 5,000 spins hands free. Meanwhile, the jaunty Mexican soundtrack can be toggled on or off as you please. Watch out for some crazy cheering Mexican crowd sounds, the bell signifying big wins, and a great gravelly-voiced Mexican commentator too! Ring Corner Feature – Wilds – Each of the four corners of the reel and row set up is a golden square. If any of the wrestlers land in any of these, they, and all other wrestlers of the same color, turn wild. This lasts til the spin stops. Things get interesting if more than one corner is occupied by a wrestler, turning more symbols wild. Lucha Bonus Feature – Free Spins – The Lucha Bonus symbol is the scatter. Three or more set off Free Spins. Three will give you 7 spins, four give you 11 spins, five will give you 15 spins. In the Free Spins bonus feature the Ring Corner Wilds still apply, except any Wild wrestler remains so for the full course of the Free Spins, not just one spin. So, if you are lucky, you’ll have four Wild wrestlers throughout up to 15 spins! Underdog Symbol – if all four wrestlers turn wild at any point then the Underdog symbol transforms itself into the highest paying of all – La Luchadora. Land 5 of these on a payline for a 250x payout. Lucha Smackdown Symbol – If this lands any time during Free Spins you will be granted a multiplier of up to 15x your stake, OR 2, 3, 5 or 7 extra spins. This can occur more than once, so there are unlimited spins to be had. Lucha Smackdown can also land in a golden corner square to turn one of the wrestlers wild for the remaining free spins of the round. With Luchadora Slot, Thunderkick have taken their product to another level again. This is a really entertaining game where theme, artwork and gameplay all come together to create a thrilling video slot experience. Remember, the volatility is high, so careful how you set your stake level. But that said, if you hit the Lucha Bonus Round and turn 2 or 3 wrestlers wild, and combine this with big multipliers, you can hit a very big payday!